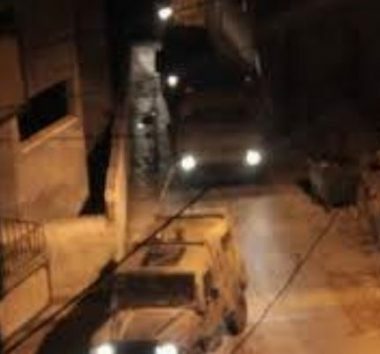 Several Israeli army vehicles invaded, on Thursday at dawn, Thannaba and Ezbet al-Jarad areas, east of the northern West Bank city of Tulkarem, searched homes and abducted six Palestinians. The Tulkarem office of the Palestinian Prisoners Society (PPS) said the soldiers searched many homes and interrogated several Palestinians before abducting six. The abducted Palestinians have been identified as Mousa Saleh al-A’raj, Osama Sufian Matar,18, Ahmad Qandeel, Aseed Bal’awi, and Ibrahim Montaser Khaled, 22, all from Thannaba, in addition to Khaled Mohammad Jawabra, 21, a student at the Palestine Technical University – Kadoorie, from Ezbet al-Jarad. Also at dawn, the soldiers invaded many Palestinian communities in the West Bank governorates of Qalqilia, Jenin, and Bethlehem, searched many homes and abducted seven Palestinians, including two siblings.